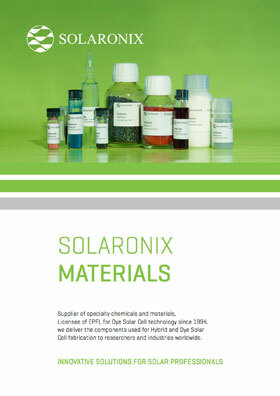 In addition to our chemicals dedicated to Perovskite Solar Cell fabrication, Solaronix is providing a kit containing ready-to-use electrodes for this novel photovoltaic technology. 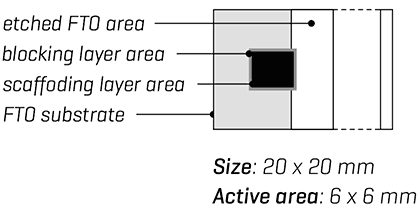 Electrodes are available at different stages of layering. The kit starts with the simplest etched FTO electrodes allowing for any sort of build-up, and extends to the most sophisticated scaffolding titania electrodes, enabling perovskite light absorber investigations straight away. Last but not least, the intermediate blocking-layer titania electrodes conveniently permit to explore planar setups or play with other sorts of scaffolding materials. Etched FTO Electrodes, 16 pcs. Blocking Layer Electrodes, 16 pcs. Scaffolding Layer Electrodes, 16 pcs.